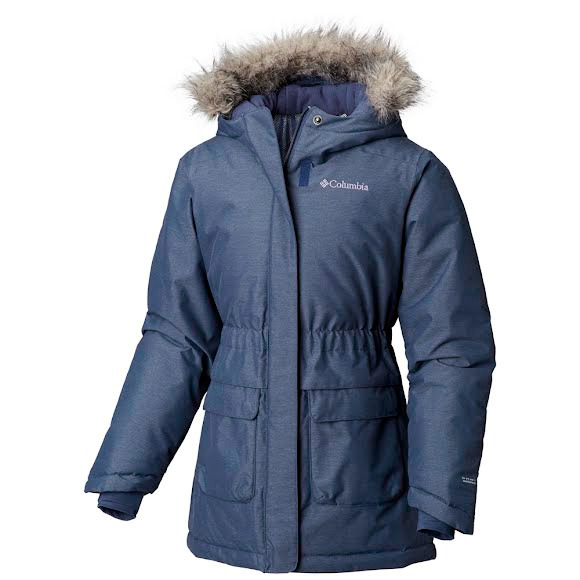 The pretty and the technical go hand-in-hand on this fully waterproof-breathable, ultra-warm Columbia winter coat for girls, featuring a toasty combination of our superior synthetic insulation and a thermal-reflective lining for great heat retention with a high level of breathability. The pretty and the technical go hand-in-hand on this fully waterproof-breathable, ultra-warm Columbia winter coat for girls, featuring a toasty combination of our superior synthetic insulation and a thermal-reflective lining for great heat retention with a high level of breathability. The rich, textured cross-dye shell fabric meets a flattering, longer cut for great coverage, while the gathered waist and a fishtail cut out at back hem ensure a great fit with tons of girlish charm. Measurements Center back length: 26.5"
This jacket is not only stylish on my 9 year old daughter but it also keeps her very warm! Goes great with ski pants and also works for an every day coat. She loves it and gets lots of compliments on it. My 11yo daughter loves this. The olive looks grown up, but the peachy details are cute. Warm and comfy. Jacket fits my daughter like the sizing said it should. Seems to be good quality, but she has only had it a few weeks. I bought this coat for my daughter and it was the best buy I have done. This coat is worth every penny. This is a wonderful coat that will keep our daughter warm through the winter! Love this coat! Looks great and will keep our daughter warm!